Tom Brady went skiing in Montana after the Super Bowl, had a super secret meeting with members of the Vancouver Canucks, and spent more than $8,500 on a winter pool cover. Oh, so this is why Brady didn’t want to hand over his cellphone. All those minute facts and more became public Tuesday evening when the NFL Players Association refiled an amended lawsuit against the NFL on Brady’s behalf. US District Judge Richard Berman, who is handling Brady’s lawsuit against the NFL in the Southern District of New York, refused to let either party submit its evidence under seal, as a way to pressure both sides to settle outside of court. 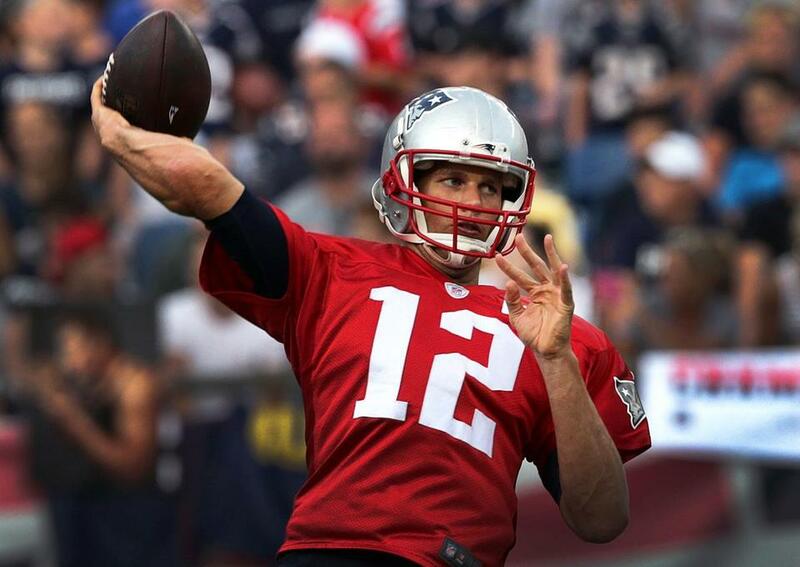 The result is that 1,408 pages of Brady’s e-mails from his Patriots account, from last September through March, were entered into evidence and made available to anyone with a PACER (Public Access to Court Electronic Records) account. The dump of information included 237 separate documents. Nothing too embarrassing or incriminating is in the e-mails — Brady doesn’t provide a smoking gun as far as having any knowledge of a scheme to deflate footballs, and all sensitive information was redacted. Hundreds of pages of the e-mails entail detailed game plans and private communications between Brady and offensive coordinator Josh McDaniels throughout the 2014 season — but they’re all blacked out. Brady calls McDaniels “bud” and “babe,” underscoring how they have more of a partnership than the traditional coach-player relationship. But the e-mails slightly open a window inside the day-to-day minutiae of being a superstar quarterback, particularly one as private as Brady. Brady received congratulations from Father Tom, his priest at Junipero Serra (Calif.) High School. Father Tom asked Brady if he would write a book with him in 2012 about Brady’s relationship with his former quarterback coach, Tom Martinez, who died that year. “Books are a project that I’m not prepared to confront yet,” Brady responded. He was asked about ESPN commentator Mark Brunell, a former Pro Bowl quarterback who has been vocal in his belief that Brady and the Patriots were caught redhanded in Deflategate. “He’s a patriot hater. They all are!!! !” Brady replied. 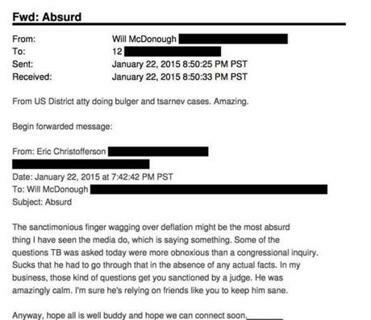 ■ Brady also received an interesting e-mail a few hours before his Jan. 22 news conference from his close friend Will McDonough (no relation to the former Globe NFL writer), warning him that Patriots coach Bill Belichick had put the spotlight squarely on Brady. McDonough forwarded Brady a report prepared by a Boston behavioral assessment company that explained how Brady’s answers on a radio show the morning after the game gave the impression that he had something to hide. ■ A family member forwarded Brady an article from Grantland.com about Brady’s rivalry with Peyton Manning, and how the quarterbacks are writing their final chapters now in the twilight of their careers. ■ Brady also gets extensive game plans and crib sheets about his upcoming opponent from “Beav,” who apparently was a young graduate assistant at Michigan when Brady played there. ■ Brady tried to meet up with professional golfer Adam Scott in Florida in March, and received a nice note from golfer Brad Faxon, who is from Rhode Island, after the Patriots defeated the Colts in November. Brady received a congratulatory e-mail from former teammate Tully Banta-Cain after the Super Bowl win, and traded e-mails with NFL Network host Rich Eisen on the day the University of Michigan hired new coach Jim Harbaugh. “Yeah it’s a great day for the wolverines. Go blue,” Brady wrote. ■ Brady is friends with Canadian businessman Francesco Aquilini — apparently their wives are longtime friends — who is the owner of the NHL’s Canucks. Aquilini asked Brady if he could speak with six Canucks players and coaches about sports science, nutrition, and body management when the Canucks visited the Bruins in Boston in late February, and Brady was happy to oblige, bringing longtime body coach Alex Guerrero with him. ■ The Bradys and the Aquilinis also dined at Oishii sushi restaurant in the South End at Brady’s suggestion. And Aquilini invited the Bradys to attend Elton John’s Oscar party and sit at a table next to the singer, but the Bradys were traveling and had to decline. ■ Also revealed is a very human and endearing side of Brady. Brady asks Aquilini if he could donate to a new foundation Brady is starting with Guerrero to help young athletes who can’t afford treatment at the TB12 rehabilitation centers, his sports therapy business venture. “I would only ask that after our meeting, if you feel like we have helped you and your team, that you would make a donation to our foundation to treat those young athletes who can’t quite afford it,” Brady wrote. ■ We learn an incredible amount of minutiae about Brady. He e-mailed back and forth with a specialist from designer Tom Ford, talking about size 12½ or 13 sneakers and how he likes polos with rugby fabric. Brady went skiing in Montana for more than a week after the Super Bowl, had a problem obtaining the TB12.com domain name, was looking at townhouses in Chapman’s Reach in Quincy, played golf at Augusta National, and spent more than $8,500 on a pool cover. The company was out of white covers, so Brady’s wife, Gisele Bundchen, picked gray.